Emma was weaned when she was 5 months, so at this point (11 months) – the weaning journey seems to be working quite well, though not without it’s hiccups where only yoghurt and fruit was consumed for weeks on end! However I’ve only felt in the past month or so that she is actually enjoying food, rather than just putting up with it and thinking “nope she’s definitely not going to give me milk”! The great news is that I’ve found some recipes that have been working really well…the kind of recipes that you’d make if you were taking her out for lunch and need a no hassle lunch that she will eat. I love rice more than anything, so it wasn’t too much of a surprise to me that Emma is obsessed with risotto. This recipe is adapted from the Annabel Karmel Risotto with Butternut Squash one (also a surefire hit!) – she really loves eating it. There are two conditions: it must have cheese and I have to add a bit more water so it’s more like a paella consistency really. 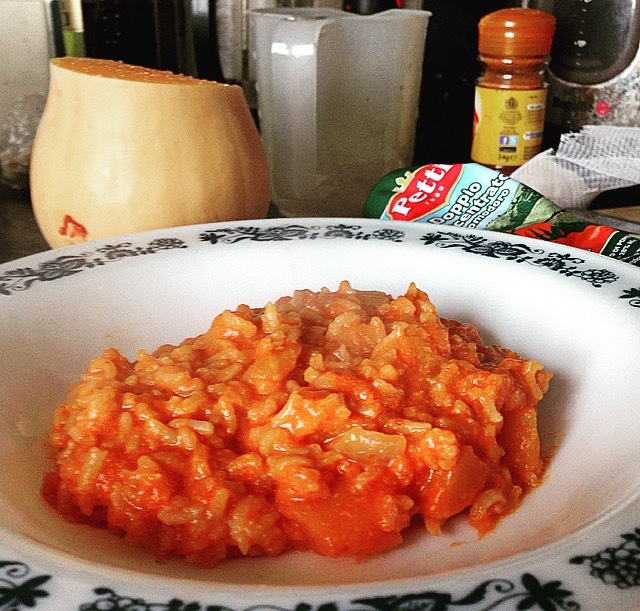 The thing I love about the risotto recipes is that it is something we can eat as a family. I have to confess that I’ve not been on board with the baby led weaning thing – actually looking back, it might have been better than spoon feeding, as Emma really struggled with textures for ages, but I liked knowing how much she had eaten at each meal. So up until now, I had been making separate meals for Emma and it was quite laborious. Often the only time I’d have to do it was right at the end of the day when I was exhausted, so this is much better. Hope you enjoy the recipe – I’ve also added a couple of other variations I’ve tried, it seems to be a all-round winner. 1. Melt half the butter in a saucepan and fry the onion until it has softened and is translucent. 2. Add the rice and cover well with the butter – then add the boiling water, cover and simmer for 8 minutes. 3. 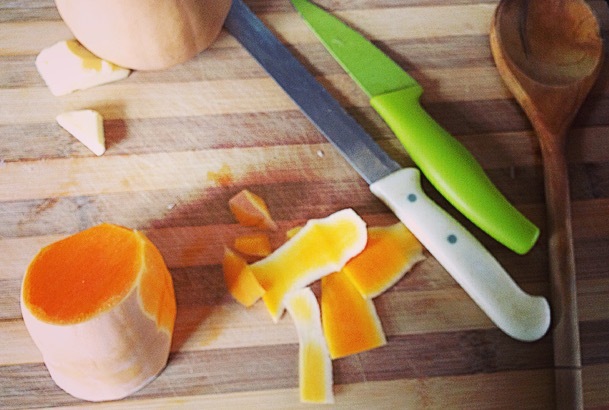 Add the butternut squash to the saucepan, and add a little more water if needed. Once the water has evaporated, the rice should be cooked. 4. Using the same frying pan, melt the rest of the butter and gently heat the tomato puree, adding in the cheese slowly until it forms a paste. 5. Once the rice is cooked, take off the heat and add in the tomato paste mixture. Stir well and either serve as it is or mash well for younger babies. Other options to try as risotto: shredded chicken with broccoli, mushroom, salmon fillet with tomato.